Last modified on August 28th, 2018 by Vincy. Google Charts is the popular charting tool library available now. It is used to create a variety of charts like Geo Chart, Bubble Chart and Pie chart. Initially, this library was used for Google’s internal applications for rendering charts. Later Google released it for the public. Google charts API has numerous functions and properties for creating efficient interactive charts. It has good cross-browser compatibility and also supports legacy browsers well. The charts are created as SVG images and embedded into the view by using the HTML5 <svg> element. Previously, we have created HTML5 canvas layer for rendering a dynamically created image object and I recommend you to go through it. Visit Google Charts documentation to know more about it. 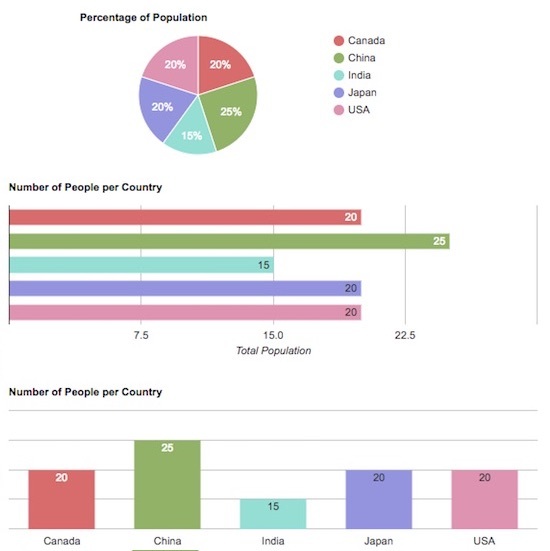 In this article, we are going to see a simple example to create a pie chart, column and bar charts using Google Charts API. In this example, the chart data are dynamic from the database. The database results are used to calculate the statistics to be seen in the graphical view. In the database, it has a table for storing people data with their country name. By grouping people by the country name, the chart will show the statistics about the population of each country. In a previous code, we have already seen how to create a dynamic data graph using Chart.js. In this section, it shows the PHP code to read data from the database table tbl_people_country. After executing the below query, the result will contain the number of people per country. By iterating this result, this PHP code splits the country and the people data into two separate arrays. These data will be set to the horizontal and vertical metrics of the graph. In this PHP code, it also forms the color specification that will be set to the chart library options while drawing. This is the HTML page used to show the (Pie Bar Column) charts created using Google Charts. It has three DIV containers to show the various type of charts. These DIVs are specified with a unique id and it will be referred while drawing the chart. Then, the chart options are set based on the type of the chart. For example, we set the vAxis, hAxis params to specify the horizontal and verticle parameters while drawing the column or bar chart. For all the charts the colors are taken from the PHP array which is predefined in the PHP code at the beginning of this example. Note: As it is done with the script on page load, we have to refresh to make the responsiveness to be effective. This is the SQL script for creating the database table and load the data that are plotted on the Google chart view. 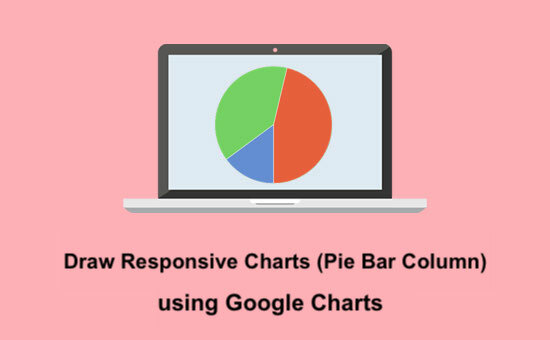 This screenshot shows the output after creating the pie, bar and the column charts using the Google Charts tool. The dynamic data and the color specification is applied to the chart view.